The weather has been chilly and gloomy lately. We’ve had over seven inches of rain in less than a week. The pond has been brutally low for two years so I’m happy to see it filling up. I’ve been taking advantage of being cooped up inside by writing and sitting by the fireplace. I’ve already blown through a cord of wood so far this season and it’s not quite Christmas. There’s something about every part of a fire I love. From the warmth, glow and dancing flames to the sizzle, pop and occasionally the violent release of steam from green logs. Building the fire is the first thing I do each morning after feeding time and I tend to it all day. I think I have issues. Who blows through a cord before Christmas…in the South? lol Now, back to the blog subject. It’s been a great season for farm donations in the form of holiday décor. 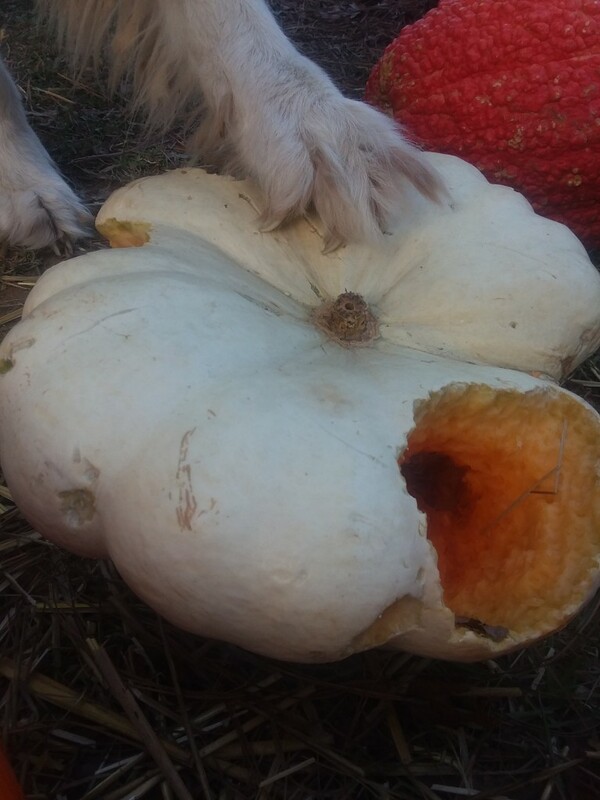 The animals have received over 300 pumpkins and gourds, 26 bales of hay and straw and even corns stalks. 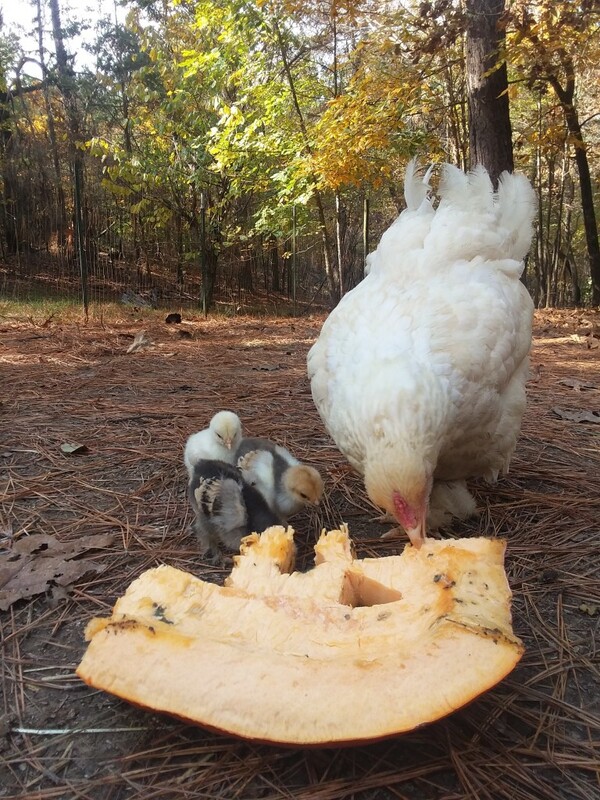 It’s been really fun to watch visitors smash pumpkins and the animals having feeding frenzies. How fun is this? 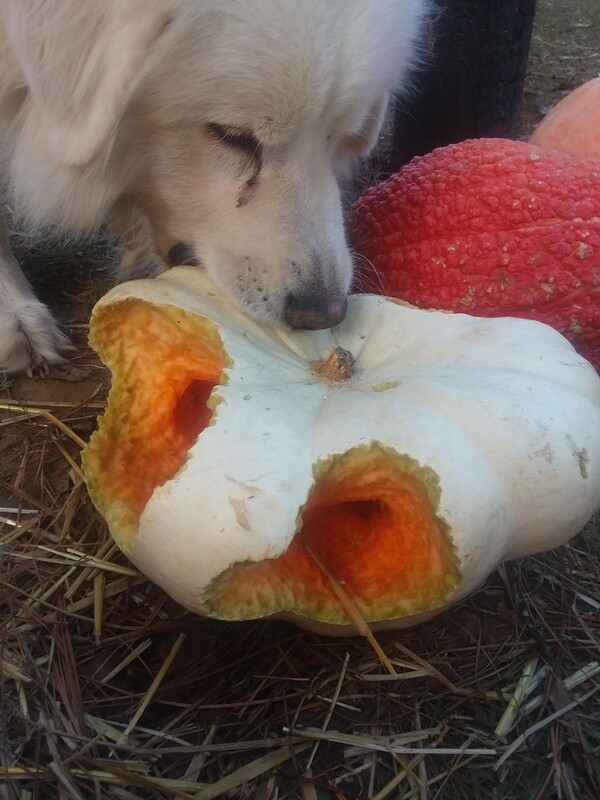 Luca has a special affinity for all things pumpkin. 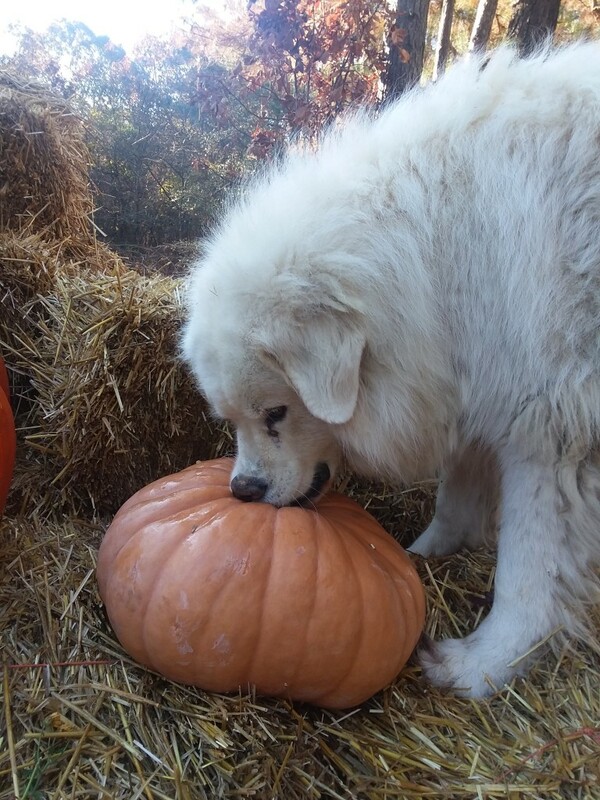 He’s been stealing pumpkins from the neighbors front porches for years. I’ve lost count of how many pumpkins I’ve replaced. Fortunately, he seems to have left the neighbor’s décor alone lately, besides, he has so many on his own property now. 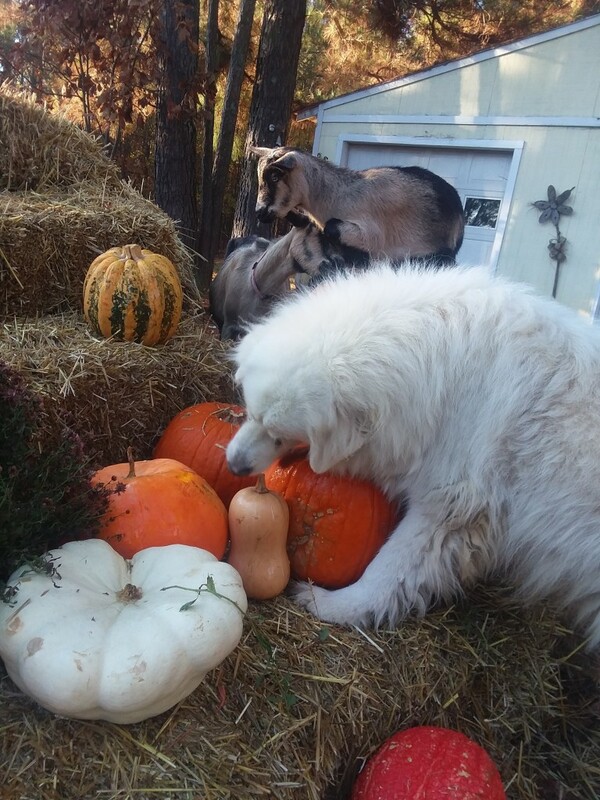 I have many pictures of Luca with pumpkins. 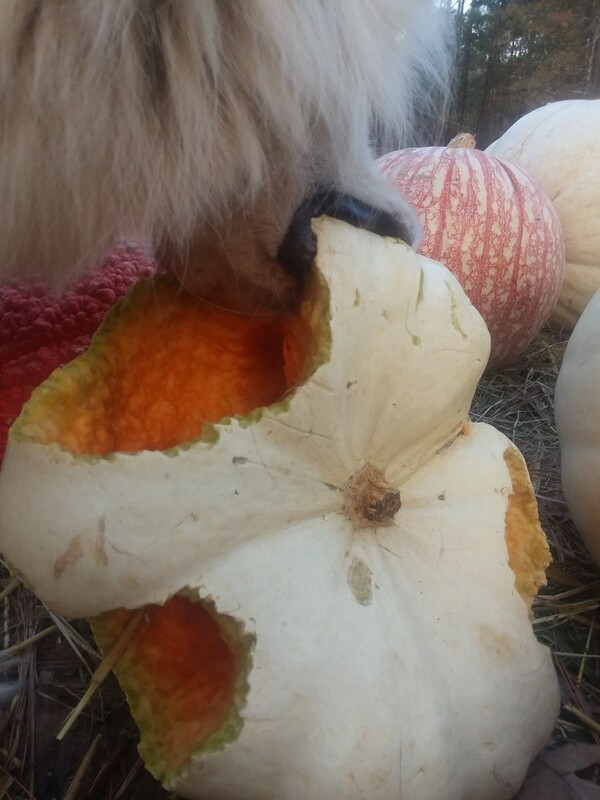 He’s so delighted to have something to destroy without getting fussed at, and it helps the birds get to the yummy seeds faster. I take every opportunity to capture the animal fun. And off he goes! Well. 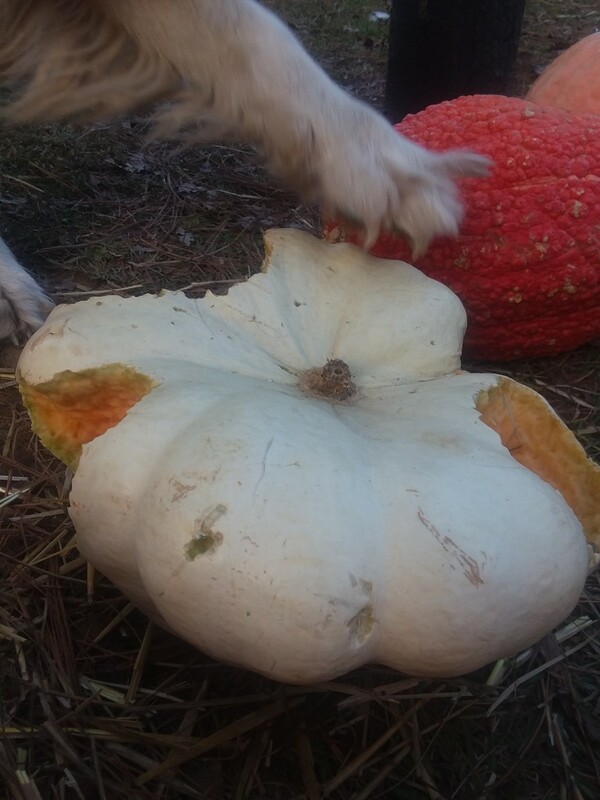 I guess he didn’t want me checking out his pumpkin! Hopefully next fall we’ll get a similar response for donated holiday items. It’s fun to share with other farms and give the items a second “life”. The straw provides bedding for the winter – and the chickens LOVE scratching through to find random bits of wheat left in the chaff. 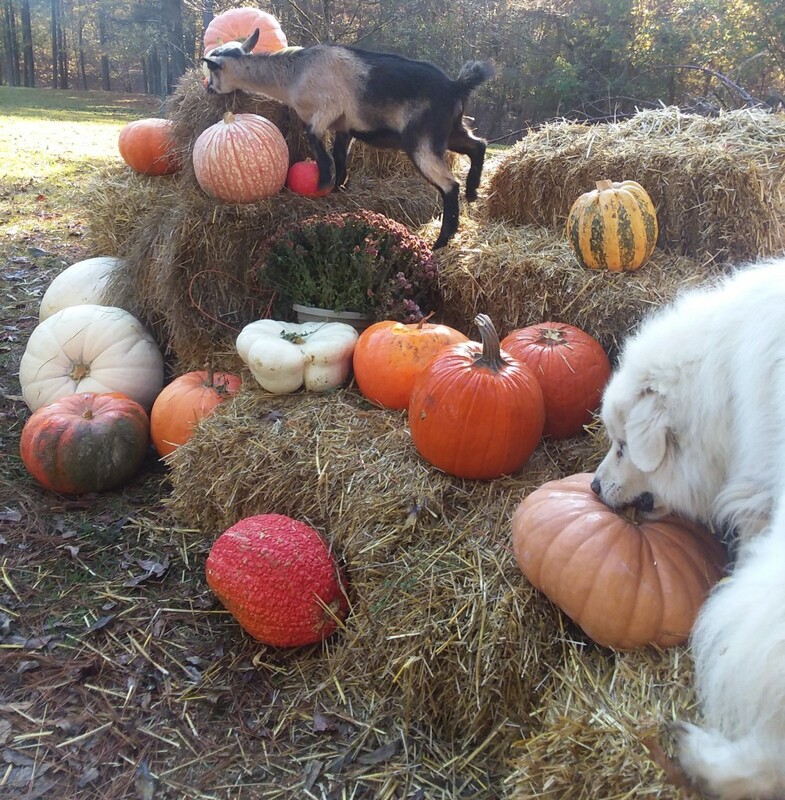 The pumpkins and gourds are nutritious treats as well as boredom busters (toys) that provide a little exercise. The corn stalks were enjoyed as well. The birds and goats rummaged through to find the regrowth of mini ears of corn. If you live near a farm please consider donating your unused (not rotten or moldy) décor. 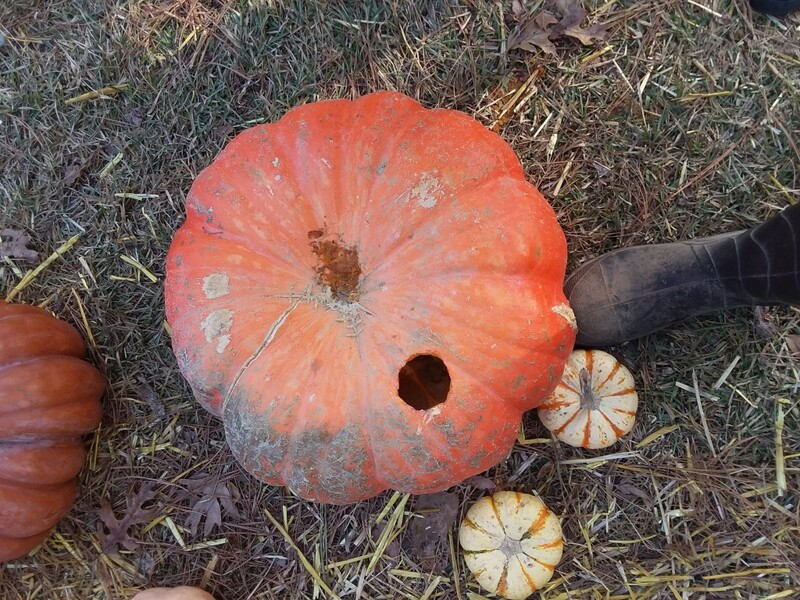 We can put it to good use – and it’s really fun to do a little pumpkin chunking while you’re at it. We even had an Ole Miss football player show up to smash pumpkins. It was entertaining to watch a giant man smash giant pumpkins. Farms appreciate any donations – from old towels, baby bottles, bedding…and of course cash donations. 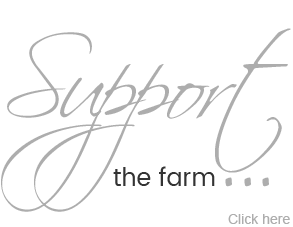 I can’t speak for all small farms but I can tell you all monetary donations to Daffodil Hill Farm go to the animals 100%. Thank you to all the people who donated this year, our first year as a non profit, you have no idea how much you’ve helped us. Winter is tough. Please consider giving to your local farms and rescues.